Simple and mild flavored rice, like coconut rice, jeera rice, bagara rice or saffron rice, compliments a spicy curry be it a vegetarian or non-vegetarian gravy very well. J doesn’t like coconut very much, so I make this using coconut milk. 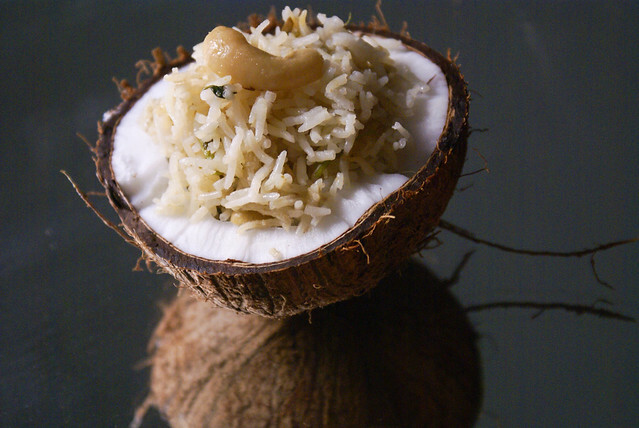 It gives rice a mild coconut flavor and tastes absolutely delicious. Depending on how you like it, you can also add shredded coconut to this, I will be posting that version later. So coming to the recipe. Take about 1 cup of fresh coconut pieces and adding 1 cup of water grind to fine paste in a food processor. Cover a bowl with a muslin cloth. Now pour the ground coconut mixture in this cloth, squeeze to extract all the milk. You can discard the coconut pulp. Wash and soak rice in 3 cups of water for 30 minutes. Heat oil or ghee in a deep bottomed pan. Add in the whole garam masala, and fry till fragrant. Now add in mint and coriander. Fry for a minute. Add onion slices, green chillies. Fry till onions turn golden brown. Add ginger and garlic paste, and fry till the raw smell disappears. Now add cashews and fry till light brown. Pour in coconut milk and water. Bring the water to a boil and add rice. Add a dollop of ghee before mixing and serve hot with a gravy. 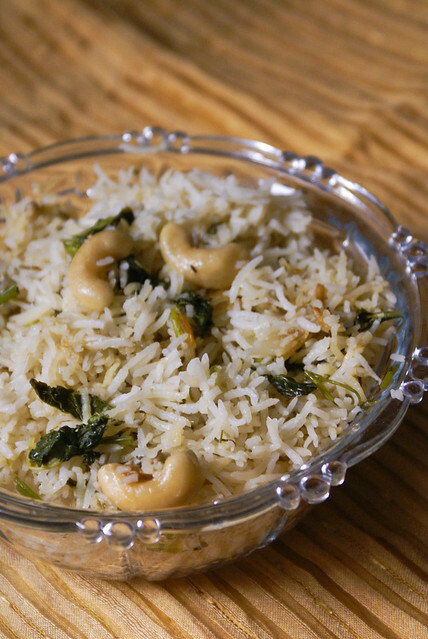 You can even make a simpler version with cooked rice. 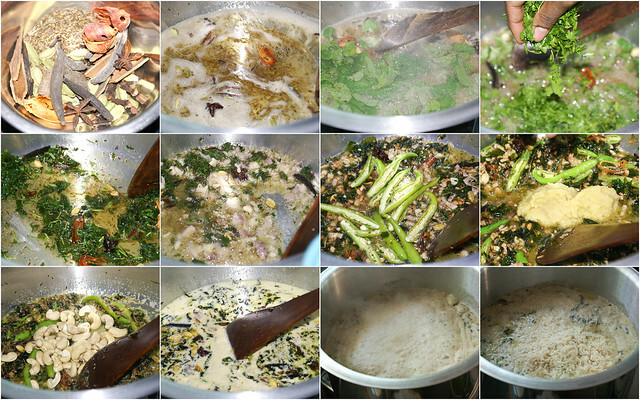 Just add in mustard seeds, chana dal, dry red chillies, curry leaves to oil, and fry for few minutes. Add shredded coconut nut, fry till golden(not dark brown). Add in salt and cooked rice. Toss well. love the rice on coconut shell, nice pics! Your step wise pics will surely make me try this soon! Love the coconut bowl. and the warm look of the rice. mom’s always have the best tips. Since going vegan, we are slowly getting more accustomed to coconut. I’ve never had so much coconut before in my life since both me and hubbs are from the north. But now its all about using coconut in dairy substitutions…my current fave is the coconut milk yogurt. using the coconut milk for the rice is such a great idea, since hubbs is also taking time to get accustomed to coconut in so many forms. flavorful for sure and love the creative presentation! Quite different from what I learned to make..garlic and garam masala is new to this recipe for me.. would like to give a try! Sounds wonderful and the clicks are awesome! 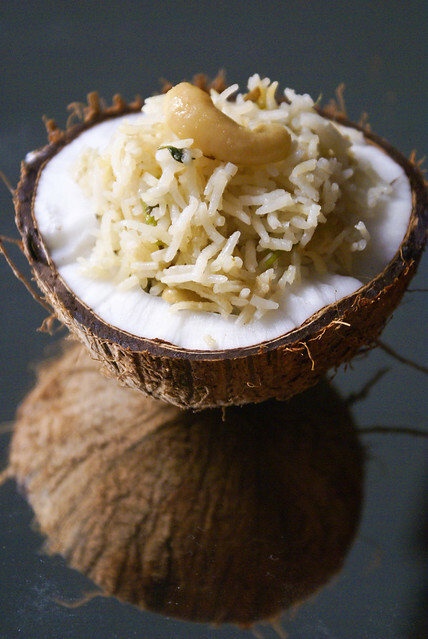 yummy and delicious coconut rice.